The Magic Flute, K. 620 (German opera in two acts). Composed by Wolfgang Amadeus Mozart (1756-1791). Edited by Heinz Moehn. For voices (solo and ensemble) and piano accompaniment. This edition: Paperback, Urtext edition. Paperback. Komplette Neuausgabe seit 05/2007. Classical Period. Difficulty: difficult. Vocal score. Choral notation, piano reduction and introductory text. K. 620. 221 pages. 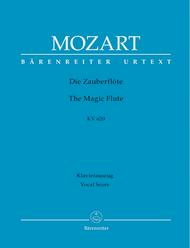 Published by Baerenreiter Verlag (BA.BA4553-90).ISBN 9790006450510. With choral notation, piano reduction and introductory text. Classical Period. 7.5x10.5 inches.